Volunteer Spotlight on Margie Simon! 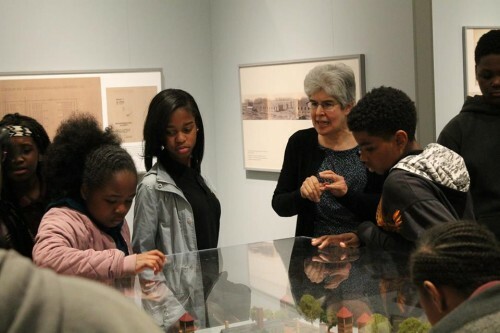 Margie Simon has been a volunteer docent at the Jewish Museum of Maryland since March. She retired in June 2016 from Baltimore County Public Schools. She was a librarian at Perry Hall High School for 16 years. Prior to that, she worked at Goucher College for 10 years and at the University of Maryland Health Sciences Library for 12 years. She now works part-time as a librarian at the Community College of Baltimore County at the Dundalk campus. She is chair of the Gemilut Hasadim committee at Chizuk Amuno Congregation, and vice chair of the Yom Hashoah Remembrance Commission. Margie has been helping with school groups at the JMM during the current Remembering Auschwitz: History, Holocaust and Humanity exhibit. In her years at Perry Hall, she became involved in the school’s Holocaust education effort and took advantage of many of the wonderful workshops and training sessions offered by the JMM. She wanted to “pay back” the JMM for all of the education she had received by sharing her knowledge about the Holocaust as a docent for this exhibit. She finds it exciting watching the students react to the model of Auschwitz. She believes we are so lucky to have the model because it makes what otherwise would be a room of blue prints come alive for students. We at the JMM also feel lucky to have Margie as a docent. She has been very effective at imparting her passion and knowledge of the Holocaust to students from around Maryland. We hope that she decides to stay involved at the museum after the exhibit closes! Post by Visitor Services Coordinator Graham Humphrey. Every month we highlight one of our fantastic JMM volunteers. If you are interested in volunteering with the JMM, send an email to Sue Foard at sfoard@jewishmuseummd.org or call 443-973-5162! You can also get more information about volunteering at the Museum here.